I have to say that even from the beginning in 1971, I was never in the Vidyadhara’s inner circle, as were others of my generation, such as David Rome, Marty Janowitz, John Roper, or Karl Springer. So this memoir is not reflective of the persona of an insider or someone who claims to have some special insight into the Buddhist path or Chogyam Trungpa. This never really bothered me, except when some of these insiders would use their position to remind you of your outlier status. Over the years I’d seen that who was “in” today, would be “out” tomorrow. But generally I felt that everything in my life was connected to the Vidyadhara. Sometimes this was a struggle and sometimes it was like making love. Generally, I had my own fate, my own path, because I was into practice. I never had any doubt that I was hard-wired to Chogyam Trungpa. I never doubted that. Besides, aside from my youth and good looks (just kidding) I had nothing that anyone in the hierarchy wanted. It was hot that day, Rinpoche had a white shirt on, and he was wearing a brace on his paralyzed left leg, from his car accident in England two years before. I saw him again the next year. He gave a talk at the same church, on aggression. He was drunk and he smoked. “I want to talk about the aggression in this room,” he began. In 1972, with just a few pennies in my pocket, I went to the first seminar at RMDC (now Shambhala Mountain Center – SMC), entitled “The 10 Bhumis of the Bodhisattva Path.” Returning to the Bay Area, I became involved in the early days of organizing the San Francisco (SF) Dharmadhatu and then Berkeley Dharmadhatu. Initially, we met in Ernie Rivera’s plastic-sheeted, rainy-season-wet SF loft. Then we were covering the roof at Jerry Grinellis’s garage in Berkeley with plastic sheets. We were the plastic sheet lineage! I segued from post-hippie cook, to gemstone merchant. In 1976, after completing part of my vajrayana preliminary practices in a swing of unedited devotion, I told Rinpoche that I wanted to work for him. He told me to “sell stones, that would be working for me.” So I got on board with “Triple Gem,” a company started by fellow students Bob Halpern, Marty Janowitz and Chuck Lief. In December of 1980, I moved to Boulder. At that time Karma Dzong had over 1400 members and it was a heady scene. I knew almost everybody. Things were changing. In reading “Born in Tibet” for the umpteenth time, I began to wonder what happened to the people he left behind. I mean Tibetans just don’t go into the free agent lama draft when their Abbot leaves. We’d seen so many big lamas come through Boulder – HH’s Karmapa, Dudjom, Khyentse, Dalai Lama, Orgyen Tulku. These were the superstars of Tibetan Buddhism. And I thought, if the Vidyadhara was big enough to attract them, what happened back home in the Old Country? I started hanging out at used book stores searching for pictures, memoirs. Anything. Lonely Planet had just published the Tibet book. I spoke to the author. At that time, the Vidyadhara downplayed and discouraged any connection to Tibet, about the same way my grandfather would think about the Ukraine. “It’s over. Forget about it.” “The dralas have left Tibet,” he said. He would mock students of other teachers who would dress in Tibetan clothes. He took his mala off his neck and threw it away in the backyard of Michael Fagan’s house in Oakland in the early 70’s, saying, “Those days are over.” He taught in English. Our liturgies were in English. Yet I wanted to go to Tibet. It was during this time, that I stuck my head out of the rabbit hole and decided to go further. To go to Surmang. As early as 1985 I had begun to study Chinese language with a professor who had moved here from the Central University of Nationalities, Beijing. Her name was Chu Xingyan. I worked like the devil and saved every penny while I lived in Robin Kornman’s house. Robin had a crush on her 18 year-old daughter, Shan Shan. Robin was just the right person. He was cheerful and literate. He was open and fearless. He liked to sing the song, “That’s What Friends are For,” a song I’ll always associate with him. Robin had Chinese in addition to a dozen other languages. He was very supportive, to say the least. In hindsight, Prof. Chu was just the right teacher, with her connections to the Nationalities University, the place with the most Tibetan scholars in China. I knew I would need help to get a permit to travel to Surmang. I thought that, in going to a closed area of China, I should try to relate to the people who were the decision makers in who comes and goes. This was a fateful decision because, at that time Yushu Prefecture was not open to foreign travel, and the Tibet Autonomous Region, 10 miles down the road, was. Today 26 years later, the situation is reversed and it is the TAR that is closed and Yushu that is open. At least to me. In the early part of 1986, I wrote a letter to the Vidyadhara and asked Larry Mermelstein to read it to him. That year, Rinpoche had pretty much stopped talking. And drinking. I thought that if he didn’t want me to go, I wouldn’t go. So Larry read the letter and the response was such that I had his blessing. I remember the night before I left in 1986, I was staying at Neely Gilette, Paul and Nan Hannon’s house in Boulder. The Vajra Regent was there. He asked me what I was doing. I said, “tomorrow, I’m going to Tibet.” He looked at me quizzically, and answered, “Why?? ?” as if I’d lost my mind. I was out of the US for the first time in my life. I went from LA to Hong Kong to Kathmandu. In Kathmandu I stayed with Tim and Elizabeth Olmsted. Tim and Elizabeth ran Flo’s, a bar in the US Embassy. I was lucky to see HH Dilgo Khyentse Rinpoche in Boudha. 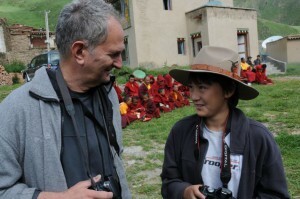 He suggested I visit Mindroling Monastery in Tibet and wrote an invitation letter. I still have it. Unlike many other expats in Nepal, I didn’t feel much of a connection to the place. It was filthy. How filthy was it? An exiled Tibetan came up to me and asked, “what do you think about Nepal.” I said, “it has lots of freedom.” “Yes,” he said, “but isn’t it filthy?” Coming from a Tibetan, that resonated. Tim and Elizabeth helped me get a ride to the border and after that I was on my own. I would walk from the end of the “Friendship Highway” overland to the Chinese border. Lee Weingrad, also known as Wangli, was born in New York City and is a product of a middle class Jewish family and suburban New York City public schools. In 1972 he met Chogyam Trungpa Rinpoche and has been a student of his ever since. In 1986 he took his first trip to abroad: to Tibet, journeying overland from the Nepal border. He lives with his wife Wang Wenjing and children in Beijing. Meeting Trungpa Rinpoche’s eldest son, Sakyong Mipham Rinpoche, in Kathmandu, the two decided to form Friends of Surmang, to bring some help to Surmang Tibetans in the form of clinics, hospitals and other kinds of community development. Lee has transitioned away from English teaching to concentrate on the Surmang Foundation’s work fulltime. Learn more about the Surmang Foundation here. You took me back to California in 1971 when I met the Vidyadhara and to that first extraordinary seminar at RMDC, events that changed my life. I might have written the first two paragraphs myself. Thank you for this and for all your work for Surmang and the Tibetan people. Yes, thank you Lee for all your work for the Surmang community. And, I hope you will continue this episode in the Shambhala Times. 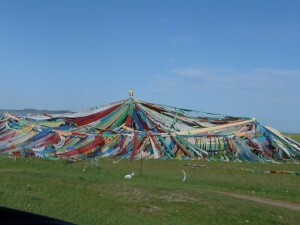 What happened after the Friendship border upon entering Tibet/China. Therein lies many a good story I am sure. Please share!